A fun, short movie about a woman with many suitors and lots of scandal surrounding her. She Done Him Wrong is a fun movie about a woman who arrives in town with some baggage that she’s trying to move past, and hopes doesn’t catch up with her. She’s not the only one with secrets however, as the man she is dating also has his hand in something highly illegal, and has a few enemies who are trying to bust him on it. The result is a fast moving, witty movie that has lots of characters and different story-lines connecting them. She Done Him Wrong is a movie that benefits greatly from it’s rather short running time. At just over sixty minutes, the movie knows what it wants to say and how long it needs to say it in. A movie like this, made today, would find ways of stretching itself out in order to at least reach an hour and a half. This movie knows better. There’s no wasting time, and everything is straight to the point with a fast-moving plot and multitude of colorful characters. At the start of the movie we are watching a number of different scenes of characters describing a woman who is coming to town. This woman is Lady Lou, played by Mae West. It all starts with a painting of her that men at the bar are admiring. Then we hear a conversation between two of them. Dan Flynn wants to take down the man who owns the bar they are at, who also happens to be the guy dating Lady Lou. After hearing his plan for exposing this man, Gus Jordan, and his secrets, we cut to a scene of Jordan himself. Gus Jordan is in a back room of the establishment, talking to his assistant, a woman named Russian Rita. Naturally all he can talk about is how excited he is that Lady Lou is coming to town. With these two scenes, there’s a lot of setup about this mysterious woman who everyone says is so beautiful and so unique. 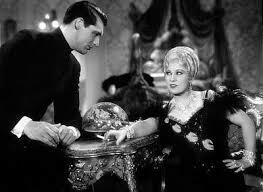 That’s when we see Mae West as Lou, riding in a carriage, on her way into town. This is old New York, and life on the Bowery. As Lou rides in her carriage, the people of the town stop in the streets and stare. Lou gets out at the bar and meets those who have been waiting for her. You can tell that most men there have never met her before and have only seen a painting and heard a message that the woman in the painting will be coming. Lady Lou arrives at the bar and pretty soon after that, she and Jordan discover a girl sitting in the corner, crying. The girl is in trouble. The specifics aren’t laid out, but it appears to be trouble with a man, and Lady Lou insists that Jordan set this girl up with a job at one of his establishments. He agrees and they help the girl out and send her on her way. It’s not long after that then a man from Lou’s past shows up at the bar. This is Spider, a friend to one of her former lovers, Chick, who is now doing time in prison. Spider is a nice guy and will do anything Lou asks him to, but he brings a message from Chick, that isn’t so great. The message is that Chick wants Lou to wait for him and needs to know if she will. He also wants her to come and visit him in the prison. Her new man, Gus Jordan, doesn’t know anything about Chick, and so Lou has to be pretty careful about this news. That’s her secret, and she gets Spider to help her out with covering for her and keeping it. Jordan’s secret is a bit more complex. He has some highly illegal business going on, and that’s what the man at the start of the film, Dan Flynn, was talking about. Whatever Jordan has his hand in, it’s the same business that he sent the girl who they found, over to. Most likely it’s a brothel and that girl has been sent into a prostitution ring. For a long while it seems like a lot of these stories have been forgotten or are not really connecting. The Dan Fink character, for example, appears in that opening scene and then does not show up again until nearly halfway through the film. That’s okay, though, because the movie hasn’t forgotten about him, and is just waiting for the right moment to bring him back in. There’s a lot to establish and introduce us to here, and the movie takes it’s first half (which is really just thirty minutes,) getting all of that right. Aside from everything else, there’s also a cop, played by a very young Cary Grant, who is hot on the trail of whatever Jordan is into. This is one of Grant’s first roles, and he looks extremely young. He’s also the least significant of the semi-important roles in the movie. That’s because there are so many players and story-lines here, that the local cop is really just a side character. She Done Him Wrong doesn’t have the best title in the world (who and what does it even refer to, Lou not waiting for Chick to get out of prison?) Still, it’s a good movie with a lot going on. 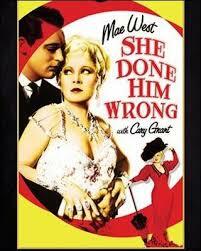 Mae West does the fast talking, witty remark thing that was so popular in movies back then. When someone says they’ve heard a lot about her, for example, her response is, “Still you have no proof.” There are lots of characters here and relationships, and the movie being only about an hour long helps trim the fat so that every moment counts.